Calixto's House of Curiosities located in Windhelm. Calixto's House of Curiosities is the home of Calixto Corrium, who also uses it as a museum of odd and curious items. Calixto's House of Curiosities is found in the east side of Windhelm, before entering the Gray Quarter. It contains only one zone; Calixto's House of Curiosities. Calixto Corrium and his sister Lucilla inherited a considerable fortune from their parents and decided to travel across Tamriel years ago. During their travels, they collected a number of curious and, some might say, legendary items. 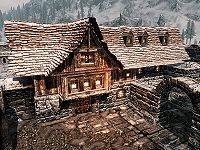 When his sister died he settled in Windhelm and opened his collection for public viewing. While Calixto is awake between 5am and 12am, his door is only unlocked from 8am until 8pm, the same as a regular store. Outside of these hours it is locked with a leveled lock. During the opening hours, you can enter the house and look around, or pay Calixto 2 septims for a guided tour pointing out the most intriguing items in his collection and proceeds to give a little background story on each of them. Upon entering, in the northwest corner, under the stairs that lead up to a small loft area, is a table holding an iron dagger, iron mace, and a copy of Nightingales: Fact or Fiction?. Against the north wall are two sets of shelves holding a bowl of void salts, a salt pile, two bowls of troll fat, two bowls of frost salts, a collection of Ancient Nord Embalming Tools, the first item shown by Calixto during his guided tour, a bowl of fire salts, a bowl of bone meal, some slaughterfish scales, seven slaughterfish eggs, three spider eggs, three chaurus eggs and a bowl of mammoth cheese, with a bottle of Frostbite venom on top of the left-hand set of shelf. Against the east wall is a third set of shelves holding three iron ingots, an empty lesser soul gem, two empty petty soul gems, a potion of minor stamina, a sample of hagraven feathers and The Book of Fate a unique book where each reader sees their own destiny, unless it is blank, which is suggested by Calixto to be caused either by the reader having no predetermined destiny, or by imminent death. This is the second item shown on the guided tour. To the right of these shelves in a southeastern corner is a round wooden table and chair, with two giant's toes and some bones on the table. Beside it is a Wooden support with three garlic braids hanging from it. Around the corner against the east wall is another set of shelves holding a bunch of lavender, a collection of Dwemer items including cups, plates and a dish and Ysgramor's Soup Spoon, the third item on the guided tour, which appears to really be a fork not a spoon. To the right is a long wooden table holding The Dancer's Flute among some skulls and bones, the fourth and final item on the guided tour. Under the table is an unlocked respawning chest which is empty. to the Right, against the south wall, to the left of a doorway into Calixto's bedroom is another set of shelves holding a woodcutter's axe and a respawning knapsack which contains leveled items, with a barrel containing foodstuffs beside it. Through the doorway is his bedroom which consists of an owned single bed along the east wall, which remains owned even after his death. Against the north wall is a tall wardrobe containing clothes and opposite, against the south wall is a square wooden table holding a bottle of Nord mead. Against the west wall is a cooking pot on a stand. Climbing the stairs to the loft area, there is a locked non-respawning chest tagged Calixto's Chest which contains the Butcher Journal, a steel dagger, along with embalming tools. There is a second loft second that is only reachable using the whirlwind sprint shout, however it only contains a large stack of crates and four barrels containing foodstuffs. If you ask Calixto for a guided tour when the shop is closed, the shop will be permanently locked. This page was last modified on 16 October 2017, at 12:28.